We analyzed over 3.5 billion Twitter ad impressions from January to June 2017. Based on our data, we saw CPMs increase from $5.30 to $6.72 during the first six months of 2017, while the average CPC increased from $0.52 to $0.80. Twitter’s CPM increased by 27% since January 2017. The average CTR on Twitter remained consistent month-over-month between February and June. 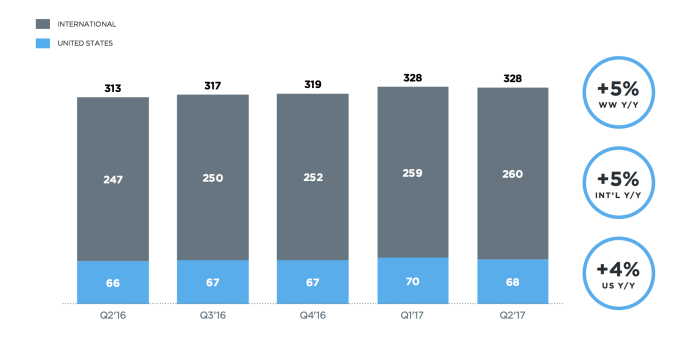 Twitter ad impressions dropped by 8% in Q2’17 compared to Q1’17, while ad spend increased by 8%. This is causing advertisers to pay more to enter the auction at a decreased number of impressions. From our data, we saw CPMs spike the last month of Q1’17 and again in Q2’17. The overall CPM increased 27% since January 2017. This highlights the volatility of the Twitter auction with the monthly ups and downs in CPMs. Twitter CPCs went from $0.52 to $0.80 in the first six months. While a $0.28 change may seem small, that’s a 54% increase in six months and may impact the ROI for advertisers moving forward. Twitter advertisers are seeing consistent CTRs month-over-month with the exclusion of January. However, it’s costing advertisers more budget to get the same result due to higher CPMs and CPCs. Our ad spend data includes all ad types ran across Twitter’s network. Below are a couple of possible explanations for the increase in CPMs and CPCs in 2017. Hanapin Marketing conducted a paid social survey asking marketers where they plan to increase and decrease budgets in 2017. 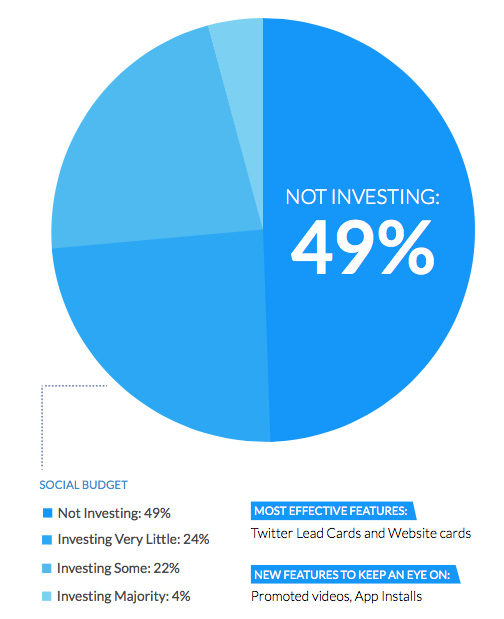 They found that 49% of marketers are NOT investing in Twitter Ads. However, 21% advertisers plan on increasing their Twitter ad spend within the next year. It appears Twitter Ads are driving results for certain types of companies. Our data confirms that Twitter advertisers are indeed increasing their budgets, as overall spend increased 8% since January 2017. Although budgets seem to be inconsistent from month-to-month. Twitter’s biggest announcements were centered around video ads with In-Stream Video Ads and promoting chatbots with Direct Messages. Are these new ad types and features enough to attract new advertisers to the platform? Or even get more budget from current advertisers? One way Twitter could help advertisers would be to offer more granular targeting similar to Facebook and LinkedIn. Ultimately, they'll need to work on keeping the ad types fresh and creative by offering more to smaller advertisers like their carousel ads. Are Twitter ads driving business results? Are Twitter ads better for brand awareness? Will advertisers run video ads like they do on Facebook and YouTube? Our mission at AdStage is to connect paid marketers quickly and easily to the data they need to understand holistic campaign performance and take action at scale. If you want to learn more about our Twitter Ads reporting solution, click the banner below to sign up for a 14-day free trial.